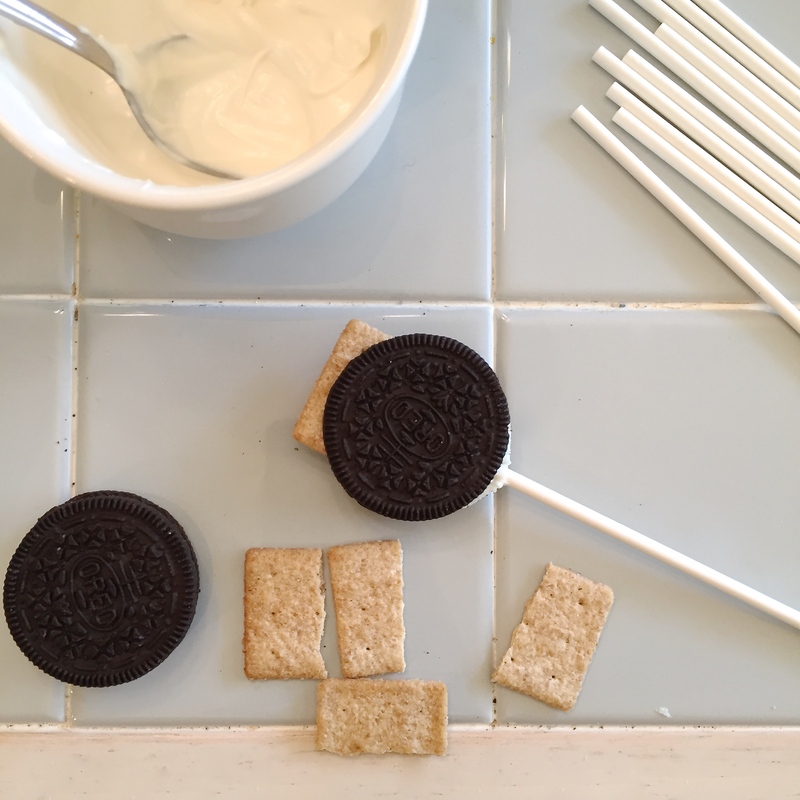 Turn your Oreos into a celebration at the beach! 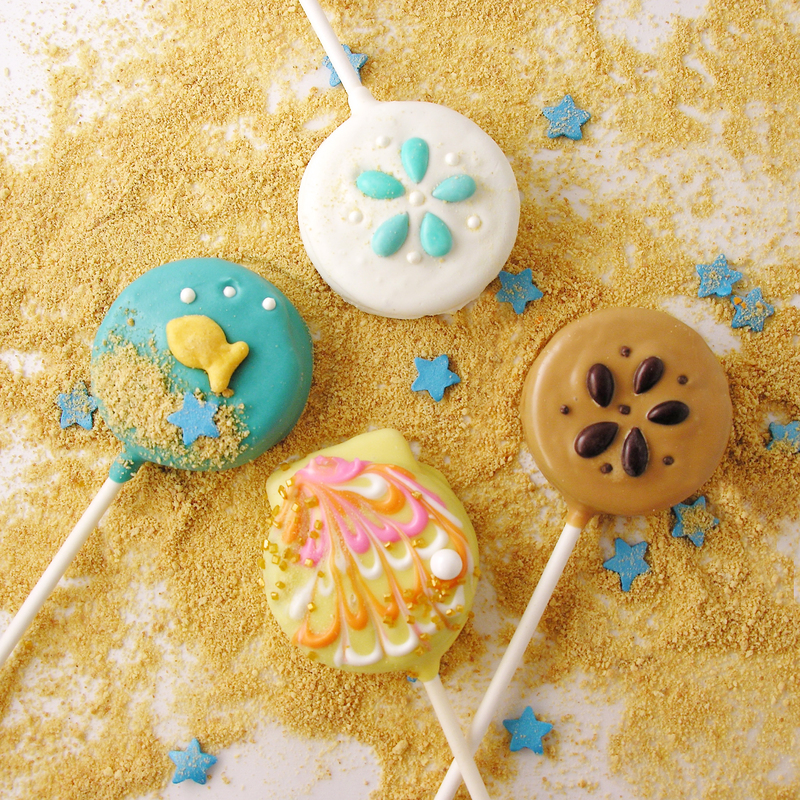 Sand Dollars, Sea Scallops and cute little fish. So much delicious fun! There’s just something about the beach that makes my heart happy! Have you ever been to Sanibel Island in Florida? It’s right by Fort Meyers. Growing up, our family spent nearly every Thanksgiving at a little condo on the beach there. They have some of the best seashell hunting in North America. As a little girl, I had a shell identification book and a big pail, and I spent hours and hours combing the beach for shells. Sand dollars were one of my favorites! 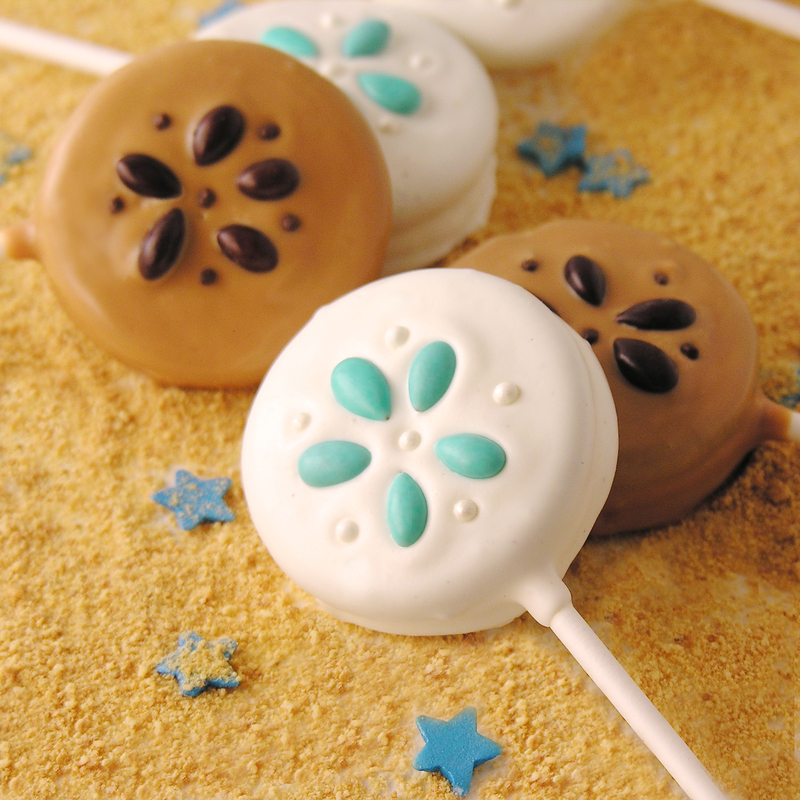 Fish Oreo Pops are from an earlier recipe here on Easybaked. You can find them by clicking here. 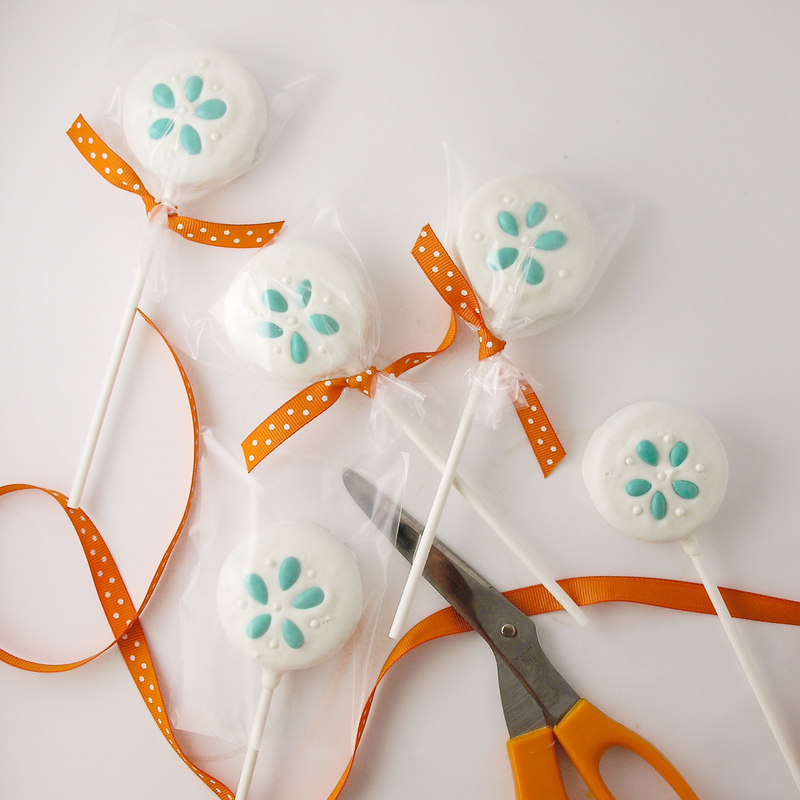 These were featured in our cookbook for kids, Life Is Sweet: 12 Baking Devotions for Kids . 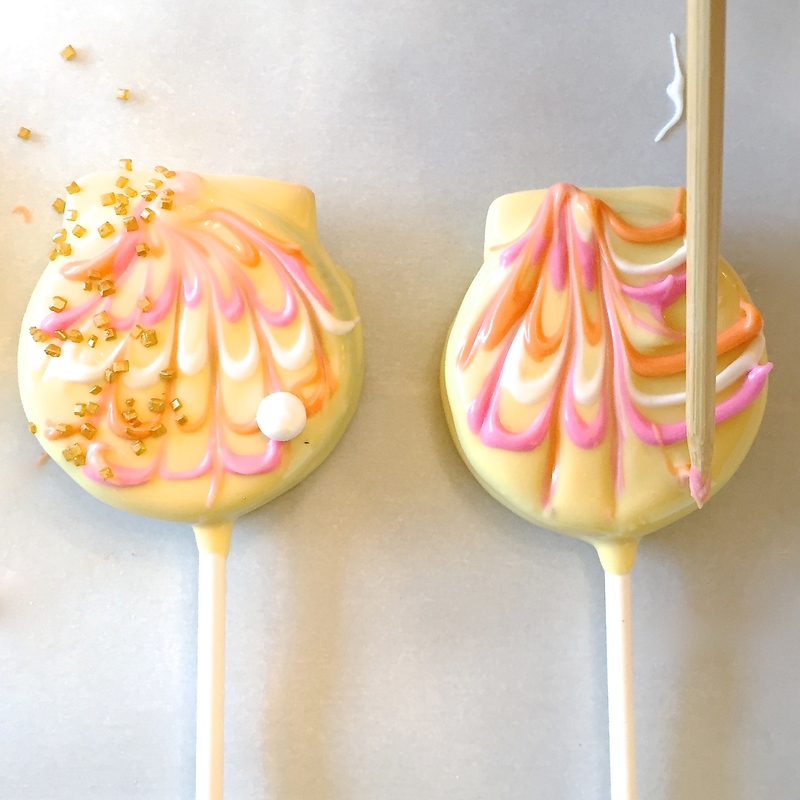 Melt about 1/4 cup white candy melts using a microwave-safe bowl in the microwave in 30 second increments, stirring between until completely melted and smooth. Place the top of the Oreo back on and allow the candy melts to harden and cement the cookie back together with the stick inside. I like to stick these in the freezer to get nice and hard. 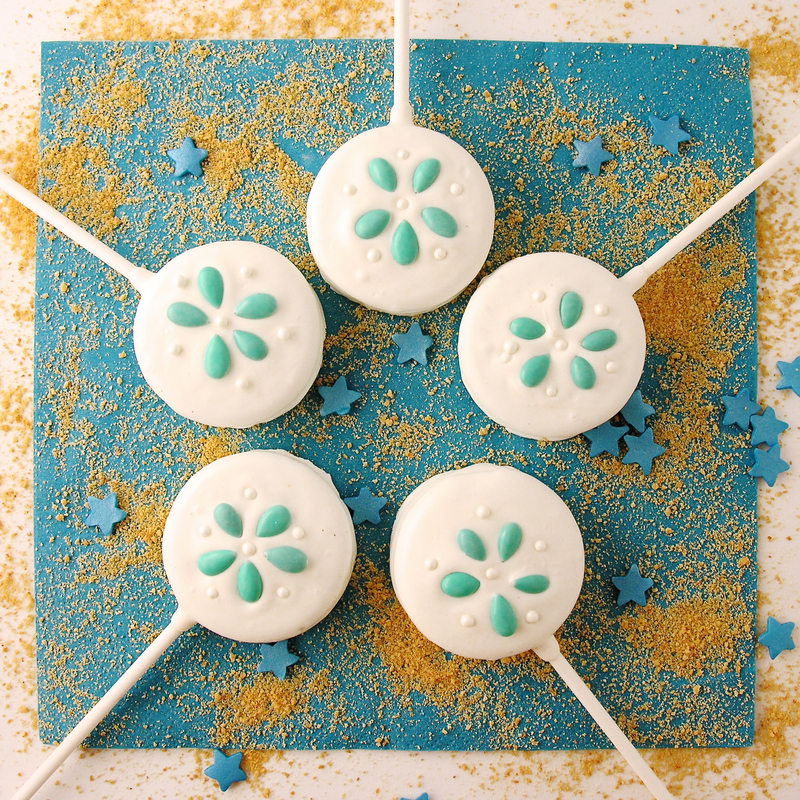 While you wait, melt your remaining white candy melts in the same manner as previously. Once the cookies are firmly hardened back together, pick one up (using the stick) and dip it into the bowl of white candy melts. Immediately, set the sunflower seeds as shown at the center of the cookie. Place pearl sprinkles as shown, between sunflower seeds. A toothpick to pull through colors and make design. Melt about 1/4 cup candy melts (any color) using a microwave-safe bowl in the microwave in 30 second increments, stirring between until completely melted and smooth. 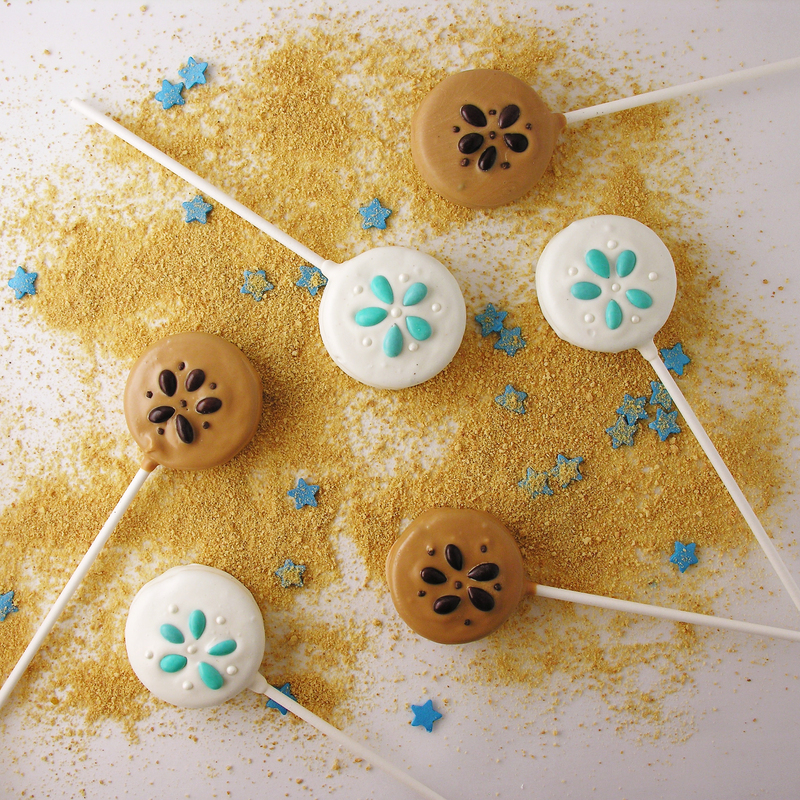 Set 1/2 of a Wheat thin cracker on top of candy melts at the top (so just the points poke out when the top is back on). While you wait, pick your “main color” and melt those candy melts in the same manner as previously. Also melt smaller amounts of two to three other colors. Spoon these into zip top bags and seal them up. 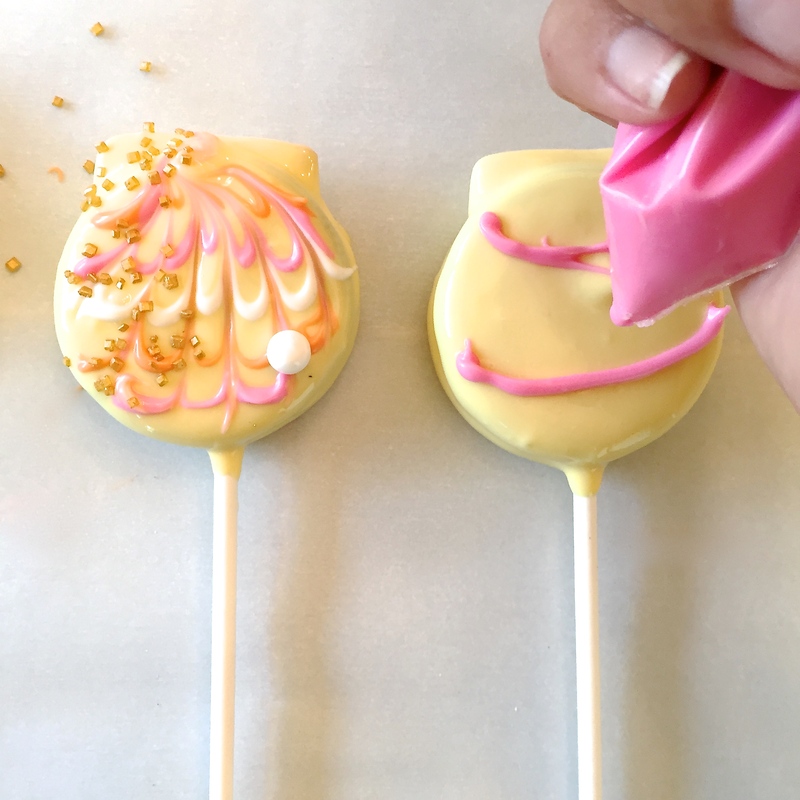 Wrap them in a warm towel to keep them melted and smooth. Once the cookies are firmly hardened back together (about 10 minutes in a freezer), pick one up (using the stick) and dip it into the bowl of candy melts. 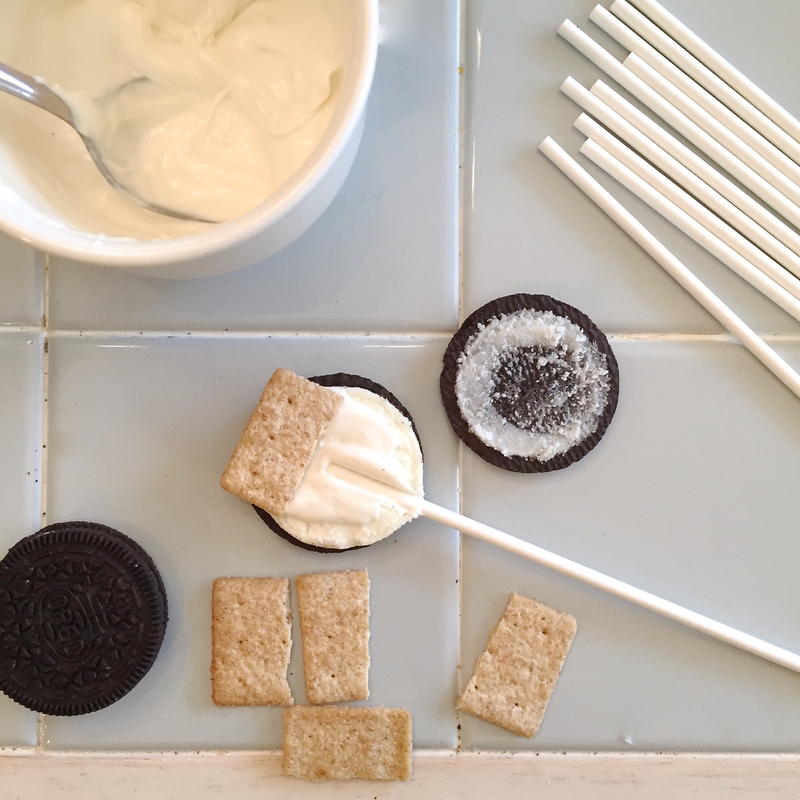 Immediately, clip a corner off a bag of colored candy melts and pipe a couple curved lines on top of Oreo. Repeat these lines with other colors and then place bags back inside warm towel. 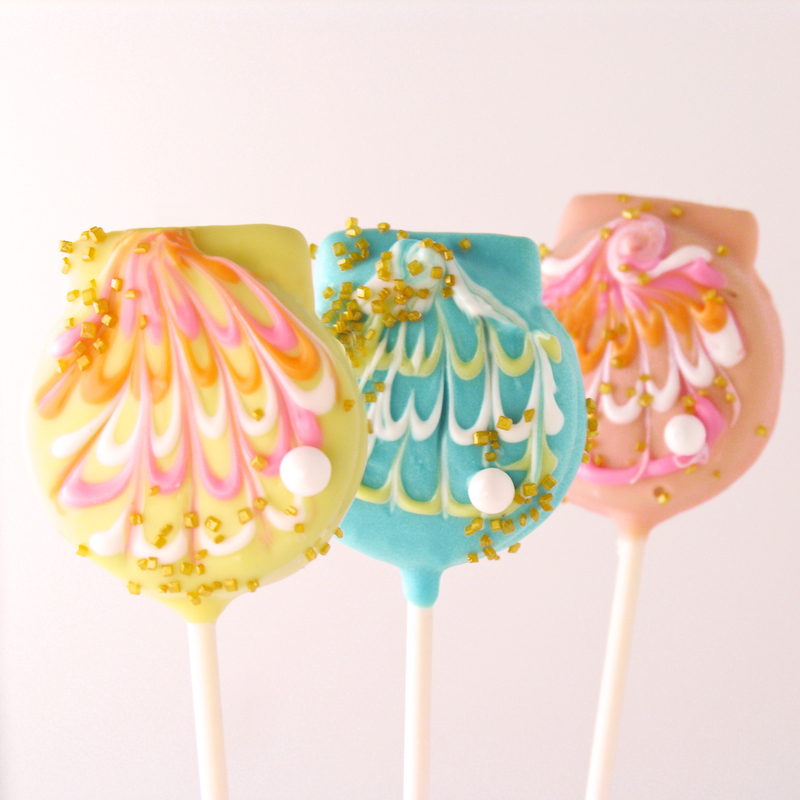 Sprinkle with a little gold sugar and add a candy pearl if you want. Repeat this process with remaining Oreos. You may need to repeat the melting process for the small bags of colors. If you need to do this, try making one of these colors your “main” color and decorating with the others! 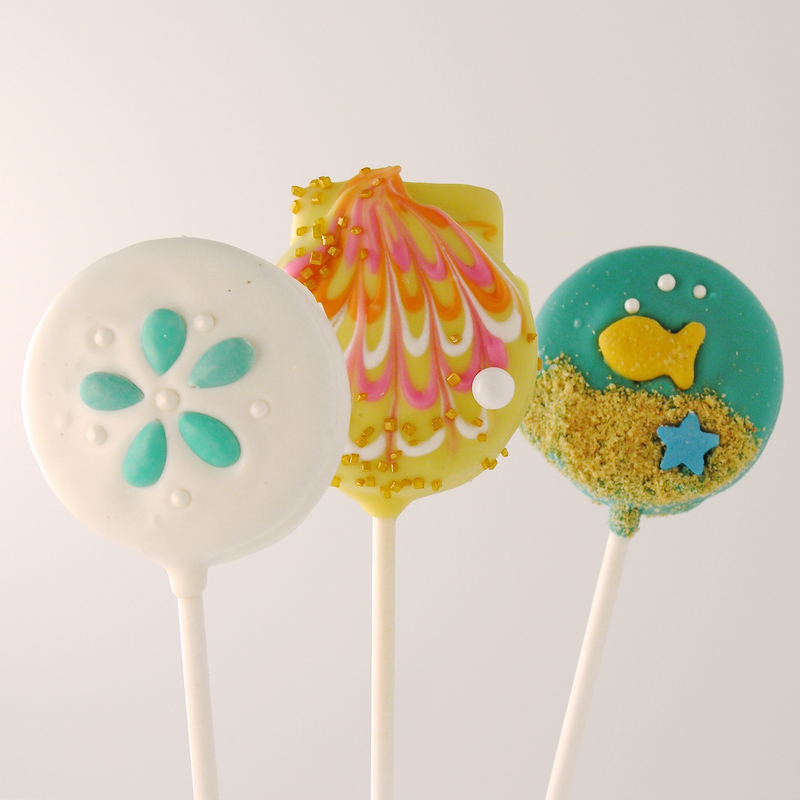 Posted in Cake Pops, Candy, Cookies and tagged beach cookies, beach oreo pops, beach-themed party, fun cookies, fun cookies for kids, Oreo dessert, oreo pops, recipes with oreos, recipes with wheat thins, sand dollar cookies, sand dollar oreo pops, scallops cookies, seashell cookies, seashell oreos, shell cookies, shell oreo pops, summer cookies, summer oreo pops. Bookmark the permalink.